But I’ll tell you, I sure was glad to come home to a lasagna in the fridge a few days later and another one in the freezer. I made a bunch of freezer meals in the final weeks of my pregnancy. I plan to do the same this time! Some people like to take a day or a weekend and prep a bunch of freezer meals at once. Instead, I planned out 1-2 meals each week that I could make a double batch of, so we could eat one that night and pop one in the freezer. That was a bit less overwhelming for me. Plus it helped spread out the cost over a few grocery bills instead of just one. We were lucky to have family and friends send us over some food during my son’s first few weeks at home. But we were fully in survival mode for the first few months, and I found it really hard to keep up with grocery shopping and cooking. I’m planning to make several healthy freezer meals, which I’ll share below. We have a second freezer in the garage so I have lots of extra space! Some I will freeze in family-sized portions, and some things I’ll freeze individually for my lunches or for a quick dinner on nights I’m solo. Finally, I will freeze some baked goods for easy breakfasts and snacks for both my son and me. I actually do this all the time anyway, but want to make sure we’re stocked up for awhile. I’m using Amazon Fresh, which is AMAZING, and didn’t exist back when I had Teddy. It’s going to make a huge difference being able to order groceries right from my phone AND have them delivered to me. I will probably rely more than usual on pre-chopped fruit and veggies to cut out some work. When the baby comes, I’m going to batch cook when possible so that when I do cook, it lasts us longer than just one meal. Nothing new- i.e., I won’t really be trying any new recipes for the first few months. Some nights will be freezer meals, and other nights will be easy staples that don’t require me reading a recipe or using unfamiliar ingredients. The plan will just be to get food on the table, plain and simple. Turkey meatloaf– I actually did this already. I made two loaves and put them raw in disposable loaf pans into the freezer. Then when we’re ready to use them I can just defrost and bake. Chicken marinade recipes you can freeze– my plan is to pick one or two marinade recipes, then double or triple it, and prep several portions to throw in the freezer. I’ll be stocking up on chicken at Costco! Easy Oven Parmesan Risotto– I love this recipe. I typically add some cooked crumbled sausage to boost the protein. It freezes really well. Sausage Minestrone Soup – a friend sent her recipe to me, but this one is similar. Glowing Spiced Lentil Soup from Oh She Glows- I might even make a double batch of this, I love it so much and never get sick of it. Pesto Chicken Veggie Meatballs from Super Healthy Kids- I like to freeze these without any sauce so that I can easily defrost a couple at a time. I usually end up using these for lunches when I need an easy protein. Bonus- my son likes them too. Frozen burritos– I linked to a post that explains the best method. I made pork carnitas last week so I used leftovers to make burritos along with, beans, cheese, and a little bit of salsa. Egg breakfast burritos– I make these all the time for my husband to grab on his way to work. He absolutely loves them. Usually I do scrambled eggs, chopped pre-cooked breakfast chicken sausage, and shredded cheese. I am going to make extra so there’s enough for me, too! Crockpot Chicken Taco Chili from Skinnytaste- I like to keep individual portions in freezer ziploc bags and then pull them out for an easy, protein-packed meal that I can serve over some microwave brown rice! Stuffed Pepper Soup from Sweet Tooth Sweet Life- This is a personal favorite. Hearty soups just freeze so well. Maple Cinnamon Oatmeal Bars from Iowa Girl Eats- I’ve mentioned these before, I just love them! I always like to keep some on hand in the freezer for both me and my son. 5 Ingredient No Bake Nut Butter Bars – These take just minutes to throw together and are so good! Healthy Banana Bread from Lively Table- perfect afternoon snack for the toddler and me! I’ll freeze either in individual slices or make muffins. Grain Free Chocolate Peanut Butter “Granola” Bars from Against All Grain- I have a feeling these will be a perfect nursing snack. Easy Pumpkin Cornbread from The Lean Green Bean- This will be perfect for cozy fall days to go alongside some soup! I’ll freeze it in individual slices. Smoothie Freezer Cubes – this isn’t a baked good but I felt like it belonged with the other breakfast and snack foods. I used different ingredients than what’s in this link, but the idea is the same. This will help make quick smoothies without taking out a whole bunch of ingredients. For my son I’ll just blend a few cubes with milk in the magic bullet, and for me I’ll probably add a scoop of protein powder. 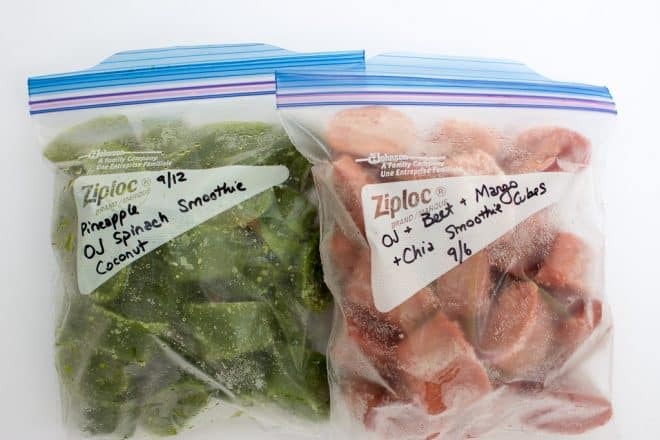 What are your favorite healthy freezer meals? Moms- what tricks did you use to get food on the table during the sleepless newborn stage? These are awesome! I’m not having any more babies right now, but I still love having some good freezer meals on hand for busy nights! Yes it’s such a help on busy nights. I don’t know what I’d do without my freezer!